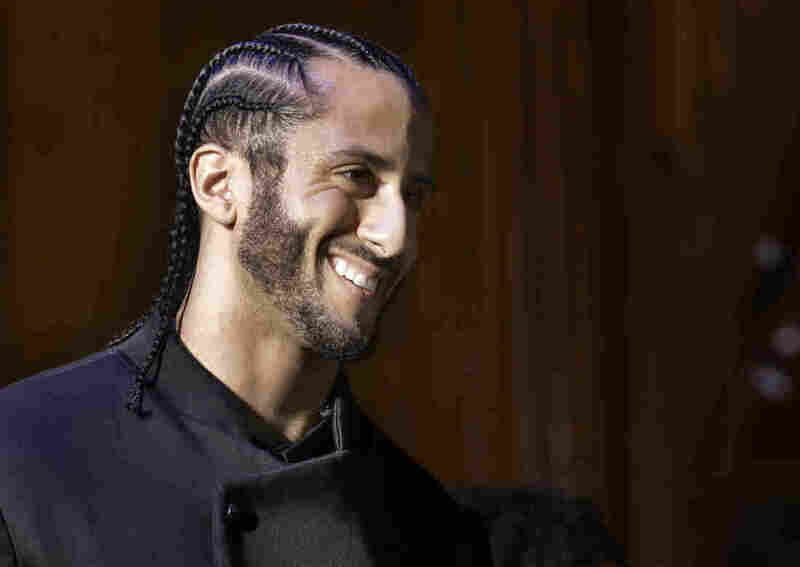 Kaepernick Reaches Agreement With The NFL An attorney for the former San Francisco 49ers quarterback tweeted that after discussions, the "parties have decided to resolve their pending grievances." The terms are not public. Former NFL quarterback Colin Kaepernick, pictured in 2018, has reached an agreement with the league over his allegations of collusion by teams. Former San Francisco 49ers quarterback Colin Kaepernick and the NFL have reached an agreement to settle his allegations that league teams colluded to deny him a contract after his controversial protests in which he took a knee during the national anthem. The league has also reached a deal with Carolina Panthers safety Eric Reid over similar collusion allegations. A lawyer for Kaepernick, Mark Geragos, tweeted that after discussions, the "parties have decided to resolve their pending grievances." The NFL issued an identical statement. Details of the agreement are not public. But, as The Associated Press notes, "Considering the lost salary both players claimed and legal costs, the settlement could have climbed into the tens of millions." "The resolution of this matter is subject to a confidentiality agreement so there will be no further comment by any party," the statement said. Kaepernick said he was protesting the treatment of African-Americans and other minorities in the United States. He started his protests in August 2016. When he became a free agent at the end of the season, he was not picked up by any team. He filed a grievance in 2017 alleging collusion among team owners to keep him out of the NFL. The quarterback scored a major victory last August, when the NFL arbitrator agreed to move forward with a formal hearing of his claims. Collusion can be hard to prove, as NPR's Tom Goldman has reported — but "to prove collusion, [Kaepernick] doesn't have to show every team is conspiring — it can be as few as two teams, or one team and the league agree they want to keep out the former Super Bowl quarterback." Kaepernick's protests inspired other players to take a knee during the anthem, sparking a political furor and major divisions between some players and team owners. Some fans interpreted the protests as an attack on patriotism and the military, leading to boycotts. President Trump encouraged team owners to take firmer action against the protests. Kaepernick has also garnered significant acclaim. Last year, Nike announced that Kaepernick was the face of its famous "Just Do It" campaign. The ads show a close-up photo of his face, with the words, "Believe in something. Even if it means sacrificing everything." Reid also was not signed after the 2016 season. The Carolina Panthers picked him up in 2018. Kaepernick has praised Reid as the first person to kneel alongside him. "Eric is a social justice warrior, continues to support his family and communities in need," he said last year. The NFL Players Association issued a statement of support after the agreement was announced. "We continuously supported Colin and Eric from the start of their protests, participated with their lawyers throughout their legal proceedings and were prepared to participate in the upcoming trial in pursuit of both truth and justice for what we believe the NFL and its clubs did to them," the NFLPA said. It concluded: "We are glad that Eric has earned a job and a new contract, and we continue to hope that Colin gets his opportunity as well."